5793 labyrinths found. Showing 4481-4500. Sorted by country, state, city, then zip/postal code. Located behind the Sutton Center, a community resource building. Take exit 121A of State Route 2 in Port Clinton, Ohio. Exit toward Port Clinton, turn left on Buckeye Blvd. and turn left into the parking lot. Drive around behind the building to find the labyrinth. Designer David S. Prudhomme welcomes you to the Prudhomme Labyrinth. In memory of his father John 'Jack' Douglas Prudhomme. David's father is always his guiding spirit since his passing in 1965. Cretan replica, created with local stone. St Paul's Labyrinth is located on South Bass Island in Lake Erie. Take the 20 minute ferry ride from Catawba Island Ohio tothe dock where various forms of transportation are available. There are also many other "Thin Places" on the island where retreat groups or individuals can pause and reflect. Labyrinth is available from dawn to dusk throughout the year (weather permitting). Retreat groups may use adjacent facilities by prior appointment. Individuals always welcome. Chartres Labyrinth in a peaceful outdoor setting. N 41 39.020° Lat. ; W 82 49.342 ° Long. Labyrinth is free to all… different labyrinth prayers are available inside the office, if you like… but you don't need them if you'd like to use your own. 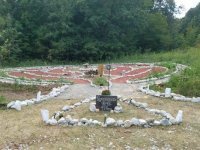 Groups are permitted to come and use our Labyrinth, please call the office to make sure the time you would like to use is available. We’re in downtown Sandusky near the Washington Park gazebo. 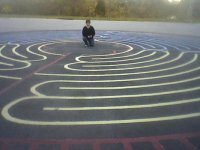 This is a portable labyrinth in our church fellowship hall, basement. Only open at special times and upon appointment. We plan to schedule some open times, but plans are still under development. Santa Rosa, 7 circuit. Drawn on canvas with markers in a vine pattern with flowers at each turn the colors of the rainbow -- and colors of chakras -- starting with the crown on the outside to the root in the center and with the seven flowers intertwined in the center. Located in the prayer garden, entrance is at the South West corner of the North parking Lot. I take to different events. I will list them as I know where I am taking it. Harmony Farm "Labyrinth in the Woods"
I-70 to St.Rt.202 North to Harmony Farm (on the left side) approx. 5 miles. Past Studebaker Rd and before St.Rt.571. 39.95 N° Lat. ; -84.14 W° Long. 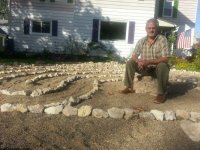 We have two unique outdoor labyrinths designed by Anne Eagle Walker and built by Unity members, especially for Unity of Toledo. The Earth and Sky labyrinth in the west corner of the parking lot is a version of the Santa Rosa Labyrinth, designed by Lea Goode-Harris in 1997. Like the Santa Rosa, our Earth and Sky Labyrinth is a seven circuit labyrinth divided into four quadrants and includes a unique space on the fourth circuit inline. Called the �heart space� this area is not walked but serve as a sacred vessel for holding symbols of one�s issues, needs or celebrations. Looking at the path, you will realize that this �heart space� is approached from all four directions, allowing the walker to view his/her symbols from various points of view. 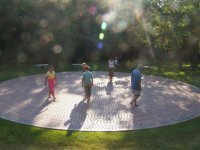 Based on the classical Baltic type labyrinth our Eagle�s Path labyrinth incorporates the Angel Garden. A relatively simple reconnection of the upper part of the classical seed pattern produces a unique feature at the center with separate entrance and exit paths. 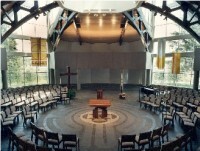 The labyrinth is not available during liturgical celebrations in the church, but is open any other time during parish office hours.